First grade teacher, Beverly Romero, created this lovely display to assign 'starring roles' in her Hollywood themed classroom! 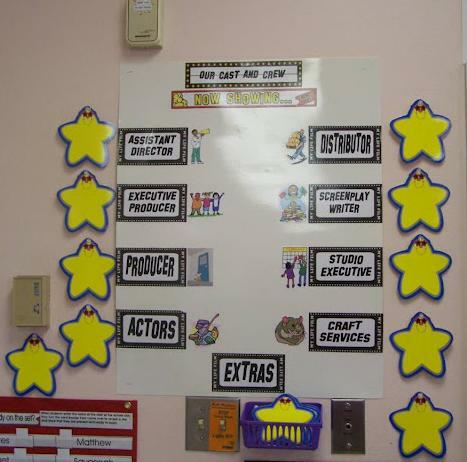 From directors and actors to studio execs and set designers, she had a job description for every role and used the board to keep track of her classroom helpers throughout the year! While we were unable to find the actual job descriptions for each of Beverly's roles, we did find another website that might be helpful if you're looking to do something similar - Kirsten Van Dyke's Classroom Page. She also had a Hollywood theme and came up with a list of roles/descriptions - i.e. "Lighting Crew. Turns off the lights with the cast and crew leaves the 'set'. Turns them back on when they return." Background: Red bulletin board paper. Title: "Starring Roles! Our Cast and Crew!" - Beverly used accents from a purchased bulletin board set, but you could also use regular bulletin board letters. Oscar's Hall of Fame: Inspiring Higher Level Thinking Learning!